MKDA completed the office design for a London-based global investment firm located in New York City, New York. The workplace MKDA designed for a large London-based global investment firm utilized the building’s existing architectural bones of exposed beams and ceilings, concrete floors, and abundant skylights and windows to create an authentic New York workplace with sophisticated collaborative spaces and a lot of event and expansion space for anticipated future growth. The landing sets the tone with a light-infused and loft-inspired canvas with polished concrete floors stained a warm dark grey; a clean and minimal reception desk with an illuminated logo; two elegant seating areas with plush custom rugs and mirrored copper globe lights; and a coffee bar and lounge. Inspired by the firm’s sleek and powerful visual brand, MKDA used a basic black-white-and-grey color palette with pops of the firm’s corporate red and desaturated jewel color tones to add polish and a worldly sophistication. Vintage and contemporary artwork and planters fill the white space while materials in various textures add interest. Private perimeter offices, conference rooms, collaboration rooms, and lounges feature glass fronts with metal frames in a grid pattern to create a visual barrier between head-down and collaborative work. Meeting spaces were dressed in wool carpets that improve acoustics, elegant drapes that frame city views, and mirrored copper globes lights centered over conference tables. 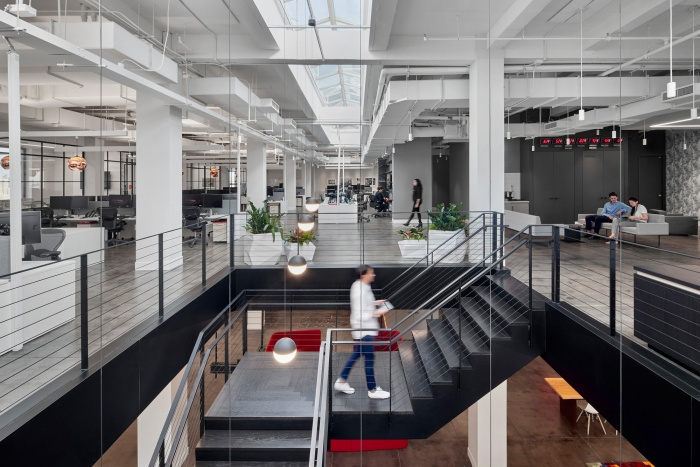 Tucked behind the reception desk, and beneath the skylights, MKDA devised an industrial-inspired deconstructed staircase with blackened cable rails set in a black metal frame and dark thermally treated treads and risers. The team created a “ceiling” out of black-and-white globe lights to add vertical lines and textures and to allow the eyes to rest at the center of the open space. A second floor, which acts as the firm’s social hub, features reconfigurable tables for collaboration; a coffee bar and cafe lounge; a self-serve buffet area and a fully-functioning kitchen for employees’ personal use and catered events. The floor is minimally furnished, but the town hall space features a custom area rug that references the firm’s brand colors as well as its commitment to the use of research and scientific data. To spark discussions, the design team added a vintage Cold War-era cruise poster, a custom full-height digital print of the original future pits of the NY exchange, and other art.